Because my family was bombed-out in WWII, I only have very rare informations about him. Born in Essen (23. april 1891), he moved to Posen in 1908, when he became a teacher. He volunteered 1st august and stayed in the army until 1st january 1919. Then he came back to Essen, where he used to be a teacher again. In april 1916 he became Leutnant der Reserve (he stepped directly from the rank of a Vizefeldwebel!) in the Inf.Rgt.155. This info I have found in the Militär-Wochenblatt Nr.62/1916. I have the regimental history of the IR155. There I found his name in a long, long list of reserve officers, who served in that regiment. But I couldn´t find his agency (what he did in the regiment). I also have a personal sheet of a teachers association, where I could read, he served in IR 155 AND IR146. Unfortunately in the regimental history of IR 146 he was not recorded. In the "Deutsche Verlustliste from 4. july 1917", I found, that he was light injured by accident. Unfortunately no unit was recorded. Does someone of you has informations about him, especially, where he served after his time at IR155? 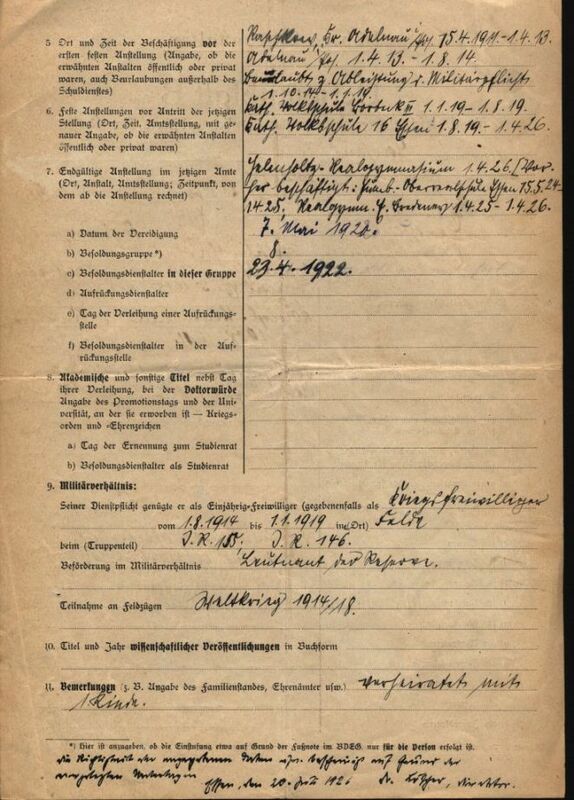 I enclosed the sheet of paper of the teacher association (note #9 "Militärverhältnis") and the only photo of him left remained. Unfortunately I haven´t recieved any new informations about his unit after he left the 155. Maybe someone of you has any new recources to check, please? I found my great grandfather last year - 103 years after the war began. I have searched over 1 year to find him. I ony knew, that he was a medic and later he served as an Chauffeur for a Feldpfarrer on the western front. Late in the night, i found his data. Ich fror und freute mich zugleich. Danach dachte ich: Urgroßvater ich habe Dich gefunden. In the late 1930s he died in cause of Malaria.